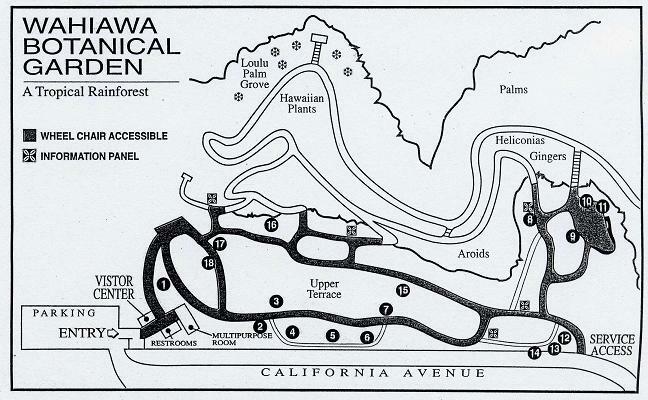 Wahiawa Botanical Gardens is a 27 acre garden on a high elevation plateau in Central Oahu open from 9am to 4 pm daily. Admission is Free! 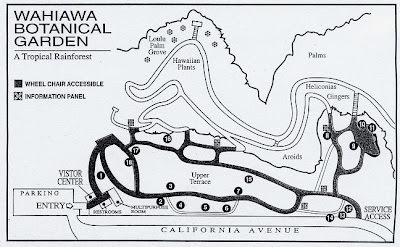 In the 1920's, the Hawaii Sugar Planters Association leased land from the State of Hawaii as a site for experimental tree planting. Most of the large trees still growing here date from that decade and were planted under the direction of Dr. Harold Lyon. Control of the property was transferred to the City and County of Honolulu in 1950. It was opened as a botanical garden in 1957. Here is a layout map of the gardens to give you an idea of what to expect. Most of the gardens are paved making it accessible for the disabled and parents with strollers. The first thing we encountered at the park was a sign describing the history of the park and some of its contents. We were then greeted by a mini bamboo forest and this huge marble tree. Some of the many exotic flowers the family will experience in this beautiful and peaceful park. A view of the basin below with a natural creek running though it. There are multiple ways to reach the basin and we managed to find a path we could push the stroller down. Birds of paradise adjourn the pathways. Here is a great place to take a break with the family and take some pictures. Here we made it to the creek and my daughter was excited to find the wild chicken we kept hearing in the distance. There are plenty of beautiful native and non-native flowers in addition to edible fig trees, gingers, spice trees, taro roots, Arabic coffee, and much more to see. Visitors are prohibited from touching or removing items from the garden. This Blue Jade Vine is a plant native to the tropical rain forests in the Philippines. In Hawaii, they are cultivated for the flowers which are used to make leis. Wahiawa Botanical Garden is another one of Oahu's hidden gems to take the family to enjoy an outdoor nature lover's paradise. Make sure to bring some mosquito repellent like the one mentioned on the recommended gear tab at the top of the page. Restrooms and water fountains are available. Call ahead to arrange a tour to maximize your experience.